Obesity is a term used to describe someone who is carrying too much body weight. In Fiji there are two ways we measure obesity- waist circumference and body mass index (BMI). See below for how to calculate your BMI and Waist circumference. Carrying too much body weight, especially around the middle/tummy area has adverse effects on blood pressure, cholesterol, triglycerides and insulin resistance. This dramatically increases people’s risk of all Non-Communicable diseases including diabetes, heart disease, some cancers and even increases the risk of asthma attacks. 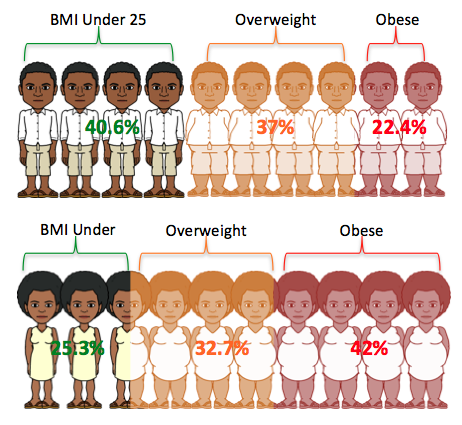 How Prevalent is Obesity in Fiji? Very! The latest results from the 2011 STEPs Survey found that since 2002 Obesity has risen by 8.5% with 32.1% of Fijian adults now classified as obese. We’re also getting wider around the middle as our average waist circumference has rise by 4cm in males and 5.2cm in females. Unfortunately this problem seems to be female orientated (although we’re sure husbands are playing a role too!). Has the increase in Obesity affected our health? Yes. Since 2002 the increase in obesity has been accompanied by an increase in blood pressure, hypertension and fasting blood glucose – all major risk factors for heart disease and diabetes. What’s Causing Obesity in Fiji? There are many causes of obesity such as family history, diet, lack of exercise, illness and medications. The global burden of disease study suggests that in Fiji dietary risk factors and lack of exercise are primary causes in Fiji. This comes as Fijians quickly move away from traditional food, and food collection methods towards convenience packed foods such as juice, soft drink, crackers, noodles and fried foods. These convenience foods have replaced healthy, Fijian grown foods – in fact only 15% of Fijians are now eating the recommended 5 servings of fruit and/or vegetables a day! How Do We Reverse Obesity? This first step to improving health is preventing further weight gain. It’s important to realise and acknowledge this as a sign of success- especially because as we age we are likely to gain around 1 kilogram of weight every year. Balancing our calories in from food and drink, with our calories out from exercise and living is the best way to achieve and maintain a healthy weight. Aiming for 2000 calories a day + getting at least 30 minutes of moderate intensity exercise on most days is the best way to achieve that balance. While too many calories in, and not enough calories out causes obesity, addressing obesity requires people to improve the quality of foods they’re getting those calories from. Low quality foods contain a lot of sugar, fat and salt and not a lot of healthy vitamins and nutrients. These low quality foods are also likely to be digested quickly, raising our blood sugar levels and leaving us feeling hungry and in want of more food/ calories. High quality foods are rich in vitamins and nutrients – especially fibre which keeps us feeling fuller for longer. Choosing high quality foods is the easiest way to eat a healthy amount of calories every day. I’ve heard obesity runs in families, so isn’t it my parents fault I’m overweight? It’s true that some people are more likely to gain and store weight more easily than others due to their family genes, however, our genes don’t have to become our destiny. There are plenty of lifestyle changes we can make to prevent this weight gain from happening. Choosing a healthy diet, staying active and avoiding soft drinks (which can actually alter our genes!) can help you and your family overcome obesity. For mothers, and women planning on becoming mothers it’s especially important to keep a healthy diet as our diet at the time of conception impacts on the genes and health traits your children inherit. How important is getting enough sleep in keeping me a healthy weight? Very important! Research has found that people getting fewer than 5 hours sleep a night were 15% more likely to be obese than people who got over 7 hours. There’s many reasons sleep deprivation can cause weight gain. For example when we are tired we’re less likely to exercise, and more likely to seek energy from food leading to more snacks and bigger meals. What’s a good way to get a kick-start to a healthy weight and lifestyle? 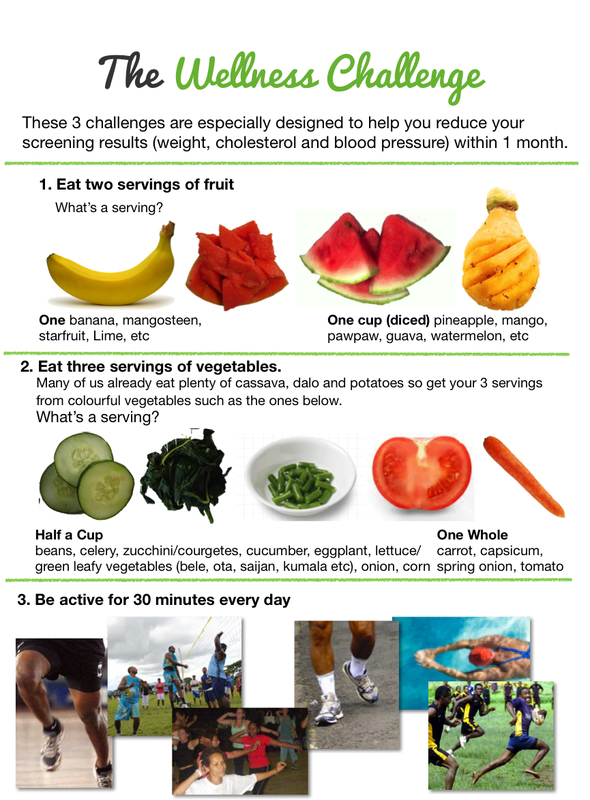 Try the three-step wellness challenge! Challenging you to eat two servings of fruit, three servings of vegetables and being active for 30 minutes every day. Following this challenge people right here in Fiji have lost over 20kg! What’s the secret behind the challenge? By aiming to have two servings of fruit every day people often start having more regular breakfast meals – a crucial part of a healthy diet. They also start having fruit for snacks rather than turning to convenience foods. A key part of the challenge is to tick of wether you have achieved these 3 challenges everyday. Keeping track of your lifestyle through this kind of tick list, or a food diary keeps you accountable everyday and has been shown to help people lose up to 50% more weight.